High-resolution versions are available on the image page. The first public showing of ‘The Peak of Eternal Light’, a new movie created using images taken by ESA’s SMART-1 lunar orbiter, took place one a week ago at the Ars Electronica Center (AEC), Linz, Austria. This movie was shown as part of a special event to mark the 40th anniversary of the Apollo 11 Moon landing, during this International Year of Astronomy. During the journey to ‘The Peak of Eternal Light’, the audience joins Commander Björn Grieger and his flight crew onboard a virtual lunar shuttle called ‘Sparrow’ for a thrilling flight over the lunar surface. This virtual guided tour across a 3D lunar surface explores Shackleton Crater en-route to the famous Peak of Eternal Light, a location 17 km from the Moon’s South Pole that is illuminated almost constantly by the Sun, making it a possible site for a future lunar outpost. A method known as shape-from-shading was used to produce the 3D lunar surface featured in the movie. The method was used in a novel way, applying it simultaneously to five images taken in diverse lighting conditions by the Advanced Moon Imaging Experiment (AMIE) on board ESA’s SMART-1 spacecraft. This model was originally developed for research purposes before being converted into a movie for AEC, Austria. The movie will be showing in the high-tech ‘Deep Space’ projection room at AEC until the end of August. It is also available to download by following the links in the right-hand menu. ‘The Peak of Eternal Light’ was created by Björn Grieger, the liaison scientist for AMIE and SIR (SMART-1 Infrared Spectrometer) two instruments that were flown on the SMART-1 mission. Grieger currently supports SIR-2, the successor to SIR which is flying on the Indian lunar mission Chandrayaan-1. In addition, he supported the calibration and archiving for all images taken by AMIE and is continuing to archive the SIR data. 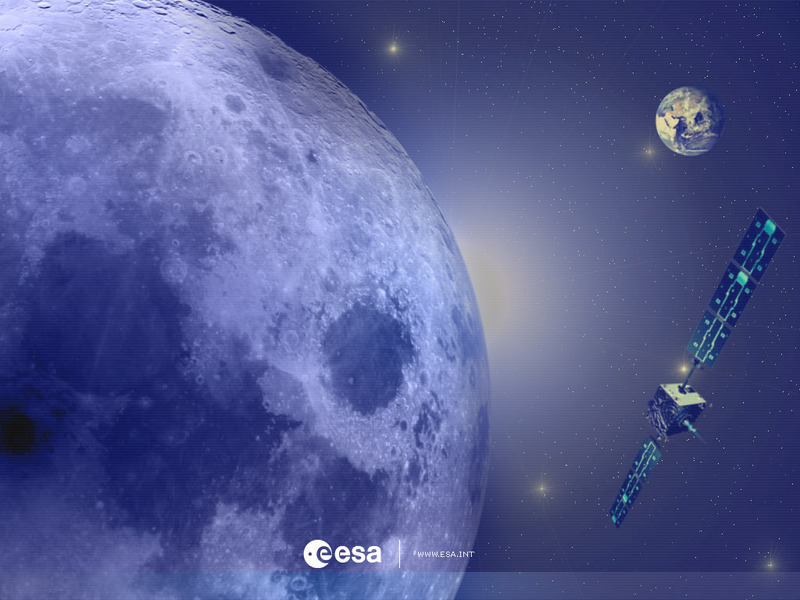 SMART-1- a Small Mission for Advanced Research in Technology - was launched in 2003 to test solar electric propulsion and other deep-space technologies, while also performing scientific observations of the Moon. The mission ended in September 2006 when the spacecraft, in a planned manoeuvre, impacted the lunar surface.